You've spent a long, boring night hanging around the ramp at the northern corner of John F. Kennedy International Airport. It's taken a couple of hours for the technician to check your avionics; you've lost an hour while he searched unsuccessfully for a needed replacement component for the DME. But the Com radio has been repaired, and now, at last, Four Six Foxtrot is ready to go. Your DME remains inoperative, but you hardly consider that a problem. DME is not required for IFR flight, and while you've always admitted that it's a nice convenience to have, you always think of it as something of a crutch—a convenience a competent navigator really shouldn't need. The weather is still negligible, and while the night is still dark and moonless, dawn will appear very shortly. 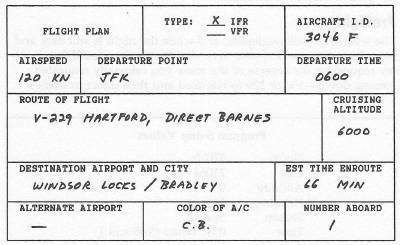 You've filed IFR to Bradley requesting the reverse of the route you originally requested coming down—Victor 229 to Hartford and then direct to Barnes. Squawk two two four zero. And hold clear of Runway 31 Right. Take your position and hold on 22 Right please. You indicate communications difficulty, request vectors out of the Terminal Control Area, and indicate intentions to continue VFR at 3000 feet. You notice that the flags on both VOR receivers now say OFF. 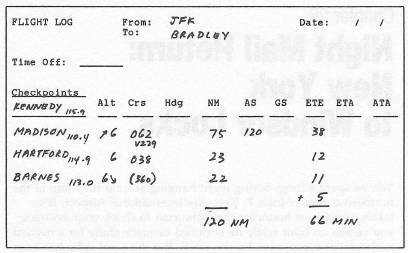 Pilots without ADF: Declare an emergency and return to JFK. Arrange for repairs, and take a Carey limo bus into Manhattan and a Greyhound to Windsor Locks. Pilots equipped with ADF: Revert to ADF navigation. 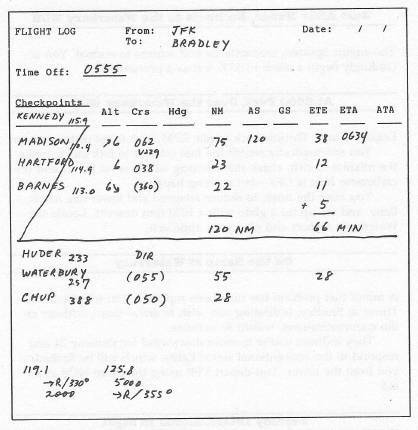 Begin to home on the Huder NDB, on 233, and rough out a revised flight log to the Waterbury NDB and on to the Chup NDB. The engine sputters momentarily and returns to normal. You accordingly begin a climb to 5500 feet as a precaution. Engine failure. Throttle back to idle RPM, and do not restore power. You automatically switch the fuel selector to both tanks, move the mixture to rich, check that the mag switch is on BOTH and the carburetor heat is OFF—but nothing happens. You raise the nose, to reduce airspeed and lower one notch flaps, and set up for a glide with a 1000 fpm descent. Locate the Waterbury Airport and plan your approach. A minor fuel problem has now been repaired. You telephone the Tower at Bradley, indicating you wish to arrive there, without radio communications, within 30 minutes. They indicate you're to enter downwind for Runway 24 and respond to the conventional signal lights, which will be flashed to you from the tower. You depart VFR using the Chup NDB as an aid. Entering downwind for Runway 24, you notice a green light being flashed from the Tower, so you proceed to land and taxi to your ramp.